It’s not always easy to tell at the beginning of a relationship if it will become emotionally abusive. Naturally, you want to know what emotional abuse feels like so you can spot it right away. At first, your partner may seem perfect. Maybe even too perfect. An emotionally abusive person can come off incredibly charming at first. The charm is what they show to the world. Friends and family might fall for it, too. The emotionally abusive person will be on their best behavior, trying to pull you in so you will get attached and need them. Human attachment is a very powerful thing. You can get attached before you know it, and then you are invested in the relationship working. That investment is what the abuser is counting on. It is not possible to have no flaws. Eventually, both you and your partners flaws will come out. Neither one of you should have to be perfect. You want a partnership where you can lovingly motivate each other to become a better person. With an emotionally abusive partner, acting like the perfect mate is just that: acting. But the only way to find out if it’s only an act is to date, take your time, and get to know them. Eventually, if you’re wondering what emotional abuse feels like, possessive and controlling behavior will slowly emerge. It can be hard to understand how this once incredibly loving and wonderful partner is now being so mean and hurtful. It’s confusing, because the abuse isn’t constant and you keep thinking that things will go back to being wonderful again. Being inconsistent makes for a very insecure and unpredictable relationship. You never know which person you will get. Just be careful about someone who can act mean or cruel, even one time. Even if they apologize later, if your partner has it in them to deal with something in a very negative way, you may be in for a roller coaster ride of emotional abuse. So if you get too attached, too quickly, it will be very difficult to leave when emotional abuse starts to show itself. Getting attached can happen in one date or in one month. That is why it is so important to keep part of yourself back. Don’t jump in with abandon. It takes three to six months of dating regularly to know if this person has the potential to be someone you might want to be with in the long term. So, take it slow. Possessive and controlling behaviors don’t always appear overnight, but rather emerge and intensify as the relationship grows. The main purpose of emotional abuse is to wear down your self esteem. You start to feel insecure and inadequate, which makes you submissive, weak and compliant. They want you to be totally dependent on them. You begin to rely on your partner more and more. Until, you only rely on them and on no one else. They make you doubt yourself and your self worth as a good person. They make you feel like you can’t trust yourself and that they are the only one who can help you. Then, you become a submissive partner who won’t challenge them. At first it may appear that your partner is really invested in your life and your decisions. They seem really interested in you. Who wouldn’t enjoy that kind of attention? But slowly it will start to spiral down as they begin to exert total control. This can lead to you avoiding being around your partner, or developing a negative self-image. A good relationship should provide protection and a safe place to be. There are many people who will try and bring you down. Life can be difficult. Your partners company needs to be a place where you feel respected, accepted and loved, even if you aren’t perfect. If you don’t feel like your partner encourages you to pursue your own leisure activities, friendships and professional goals that bring you fulfillment, then you may be experiencing emotional abuse. A partner needs to embrace your interests rather than dismissing them or finding fault with them. Also, an emotionally abusive partner will not accept any responsibility for their behavior. They turn everything around on you and blame you for their own shortcomings. You may begin to notice unpredictable behavior. This can take the form of yelling, criticizing you, threatening you and scaring you. Other ways your emotionally abusive partner exerts control include calling you names, refusing to trust you, demanding to know where you are every minute, being jealous, isolating you from family/friends, and blaming you. If you are questioning your own perception of reality, thinking that you are crazy, you might be a victim of gaslighting. It causes you to doubt your own feelings and instincts. With this accomplished, the abusive partner begins to exert more power and control. If you doubt your own sanity, and are told not to trust yourself, you are then more likely to stay in the relationship. Over time, you can start to feel more and more confused, anxious and depressed. No matter what, you are not responsible for someone else’s bad behavior. Being emotionally abusive is a way to create power and control over another person. No one ever deserves to be abused. 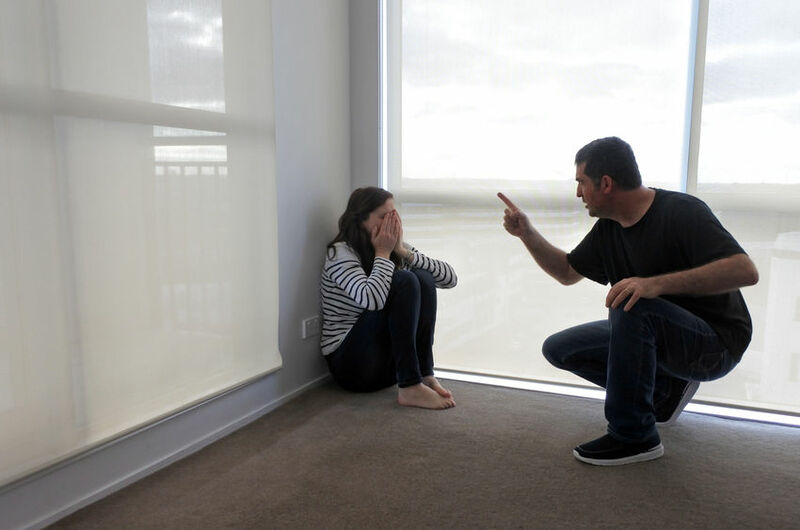 According to the National Domestic Violence Hotline, nearly half of all women and men in the United States have experienced psychological aggression by an intimate partner in their lifetime (48.4% and 48.8%, respectively). Once you recognize that you are in an emotionally abusive relationship, you can start to take steps to reclaim your life. Start making yourself a priority, and don’t worry about pleasing an emotionally abusive person. Self-care is very important, so see your friends and family, take a walk, or do something that you enjoy. Don’t blame yourself and don’t try to fix them.. You can’t control them and it isn’t your responsibility anyway. Trying to fix it or take responsibility only engages the abuser more. Instead, walk away if you can. Go in the other room and start setting limits. Start talking to friends, family and to a therapist who can help. Building a support network will keep you from feeling lonely and isolated. If your partner has no intention of changing, you may need to end the relationship. You can discuss this with a friend, family member or therapist. You can also visit the National Domestic Violence Hotline website. If emotional abuse is causing you a lot of anxiety and/or depression, you may be interested in EMDR or neurofeedback, in addition of talk therapy. These treatments help you feel more resilient so you can reclaim your life. If you can relate to this article, and would like to talk to someone about this, feel free to reach out to me by leaving confidential voicemail message at 310-314-6933 or email me at mfoxmft@yahoo.com.